Mr. Umaru Napoleon Koroma (centre) at the SLPP NA convention last month. 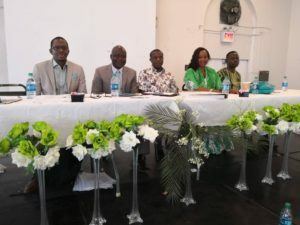 The Secretary General of the ruling Sierra Leone People’s Party (SLPP), Mr. Umaru Napoleon Koroma, has concluded successful tour of the party’s United States of America and United Kingdom/Ireland branches. In the USA, the SLPP scribe oversaw the North America convention on October 26 &27 which led to the election of a new executive. At the SLPPNA convention, Mr. Koroma delivered a well loaded speech in which he thanked the branch for their invaluable contribution to the success of the party in the March 2018 polls. He also paid glowing tribute to the USA branch for sustaining the party over the years when it was in opposition to the point of winning the March polls. He catalogued the successes of the SLPP government in just over six months and encouraged members to be defenders of the party. He concluded his speech at the convention hall by entreating members to be role models and trailblazers as the SLPP is the only party that has the people of Sierra Leone at heart and works towards improving their living standards. 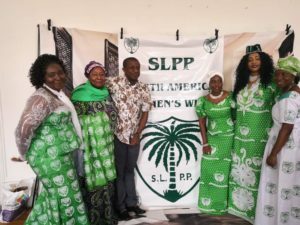 From the United States of America, the SLPP scribe jetted to the United Kingdom and met with the executive and elders of that branch, where he reiterated a similar message to the membership. He encouraged them to put aside all differences and work towards the success of the now ruling party. He expounded on President Julius Maada Bio’s vision for the country, and encouraged them to be a part of it.